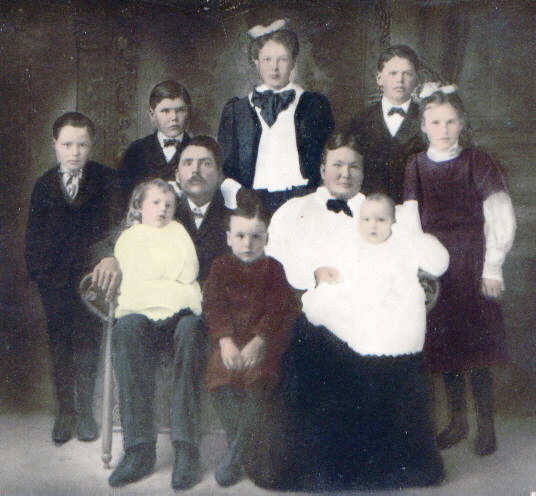 PICTURE ABOVE: The William Clendennen Family (left to right) back: Floyde, C.D., Maude, Roy, Zoe. front: Eula, William Clendennen (father), Eugene, Alzora (mother), and Matthew Bolen (baby). 2. Daughter, Heiress of Brittany (b: after 0845 d: unknown) m: Gurvand, Count of Rennes. 1. JUDECAEL, Count of Rennes, (b: unknown d: unknown) ruled Brittany from 0877 to 0888 when killed in battle. 3. JOHN OF COTTON (b: unknown d: unknown) m: Isabel de Rihil, heiress to the manor of Wittingham in Northumberland. 7. ISAAC CLENDENNEN (b: 1811 TN, d: 1860) m: LUCRETIA A? 1. 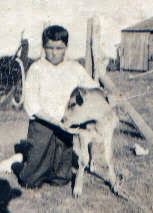 NORMA JEAN CLENDENNEN (b: Nov 10, 1927 Texon, TX) m: OREA ALVIN EHLERS, JR.
1. ORENE ELIZABETH EHLERS (b: Oct 27, 1945 Sinton, TX) m: (1) LAWRENCE REEVES BURNSIDE (2) WAYNE LEE HARRIS (3) MARK DOUGLAS CUSTER. 2. BARBARA JEAN EHLERS (b: Aug 2, 1947 Sinton, TX) m: (1) RICHARD ROYAL (2) DOUGLAS NOEL STEPHENS (3) GARNER GENE FARRIER. 1. CHRISTOPHER NOEL STEPHENS (b: Jan 11, 1969 Corpus Christi TX). Information contained on this page was gathered from members of the Clendennen family,the Dukes of Brittany family tree : 826-1514, Wikipedia Encyclopedia, the Family Search Internet Genealogy Service and Gary Clendennen Genealogy at Rootsweb. I cannot vouch for the authenticity of any of this information.